According to the CDC, the Ebola caseload in Liberia and Sierra Leone could top 1.4 million people by late January without significantly faster steps to control the spread of the virus. 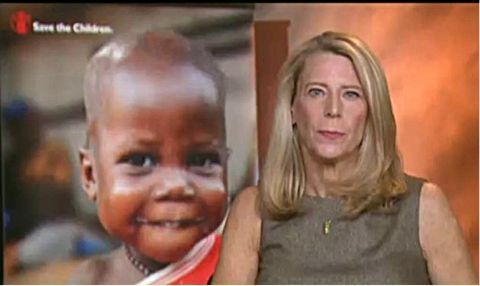 Your News Cafe talked to the President of Save the Children, Carolyn Miles, who just spent three days meeting with children in Liberia left orphaned by Ebola and where her organization is setting up ten treatment centers. Your News Cafe: It’s so hard for us to even imagine what it’s like on that front lines of the Ebola epidemic in Liberia. What is it like? Carolyn Miles: Well, it’s a pretty scary place right now, but the good news is that people are treating this very seriously. There are posters everywhere talking about what Ebola does and how to recognize if you have it. There are lots and lots of things that people are doing and Save the Children is building treatment units and is really focused on children. There are almost 2,000 orphans now in Liberia whose parents have died of the virus. We’re working very hard on that issue. Your News Cafe: You met with children and families who had gone through the incubation isolation period and were not considered infectious. What can you tell us about the kids you met with? Carolyn Miles: More than 2,000 children have nowhere to turn. When they take the bodies they burn everything inside the house and so these children were living on their own with basically nothing A lot of people in the community are very scared of kids who have lived with an Ebola victim so they were getting very little support. Your News Cafe: We were talking about the possibility of more than a million being infected by late January with this particular virus — how are aid groups like yours stepping up the response to the outbreak? Carolyn Miles: We all do have to do more to change the transmission rate of this disease. Right now, for every person who’s getting it, two more are getting infected and that’s what you have to break. That means getting people out of their homes and into some kind of treatment, which is why many of us are working and there are many organizations there working to build these treatment units and to build the larger hospitals where people can go. I think Americans are very nervous about this disease and about it coming here. but the biggest thing that we can do right now is to support the efforts in West Africa to stop it and to urgently get more resources to stop the disease there. Your News Cafe: Tell us what you did to protect yourself while you were on those frontlines. Carolyn Miles: You can stay safe. Nothing is 100%. but one of the things that you do is you spray your hands or wash your hands with a chlorinated water solution every time you go into and out of a building. You spray your feet if you’ve been in areas where there’s been Ebola with a chlorine solution which does kill the virus. You don’t shake hands. You don’t hug people. There really is no touching and if you’re in a treatment facility with Ebola patients, active patients, you wear full protective suits. So there are things that you can do to keep yourself safe and I salute those doctors that are going because at the end of the day, we need more doctors there and more opportunities for treatment. Your News Cafe: Do you have concerns for your team in Liberia? Carolyn Miles: I do worry about our staff there but on the other hand, they need to be there to work to control this epidemic. There just aren’t enough beds for people to get into treatment so people are treating at home and then multiple people are still getting sick. By the end of the month, Save the Children hopes to have two care centers up and running in Liberia. Your News Cafe: What can be done right now to help those organizations that are on the ground in West Africa? Carolyn Miles: One of the biggest things people can do is support organizations like Save the Children to help children. There are so many orphans from this disease and if you go to our web site at SaveTheChildren.org, you can learn more about how to help. We’re giving out survivor kits, for example, to these kids, which include food and household items, et cetera. that’s how people can help. Your News Cafe: Save the Children is making a big difference as it helps children in desperate need and has 150 people on the ground in West Africa. They are working with partners to help prevent and address the disease, including building ten community care units in Liberia to get people out of their homes. In order to prevent new cases, they are training vitally important frontline health workers, distributing protective kits and equipment, reaching tens of thousands of people in communities with information on how to limit the risks to themselves and their families, and supporting children who have been orphaned by the virus. You are currently browsing the archives for the Save the Children category.